Covers with catalogue number 7060 and lower with GEM imprint are second covers, for which the original cover is without GEM. For example 7005, below, has the 1st cover design and no GEM imprint; the second typography cover has GEM imprint. 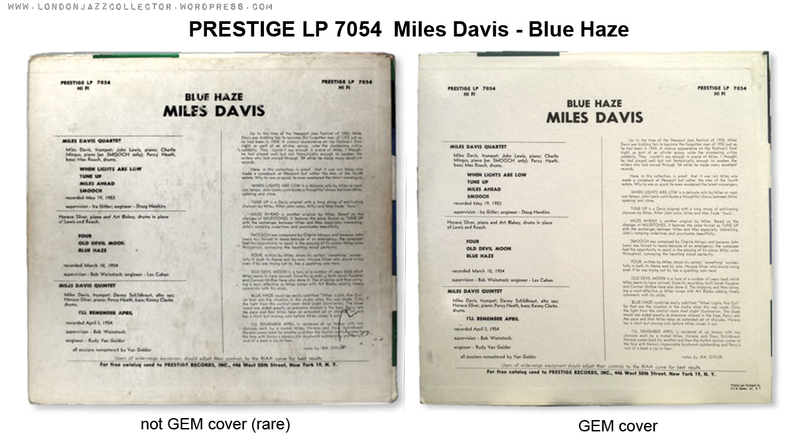 Doubts have been raised regarding a few titles below 7061 that are commonly found only with GEM and not found without – 7044 Miles Davis Collectors’ Items and 7054 Miles Davis Blue Haze. 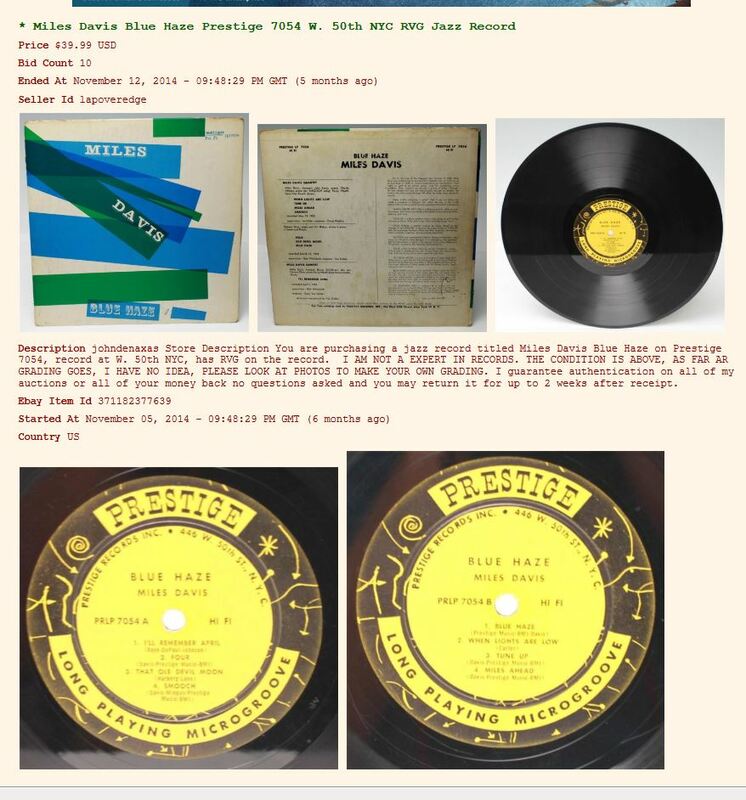 Though rare, one copy of 7054 Blue Haze without GEM has been found (without any remark on cover status from the seller). Screengrab, left, and 1:1 comparison between the non-GEM and GEM cover below. The GEM and non-GEM back cover are otherwise identical in all respects. While the Yellow and black fireworks N.Y.C. label address is always 446 West 50th St., the cover address abruptly changes to 447 West 50th St., at PRLP 7046, following Prestige renting additional office space on the other side of the street. 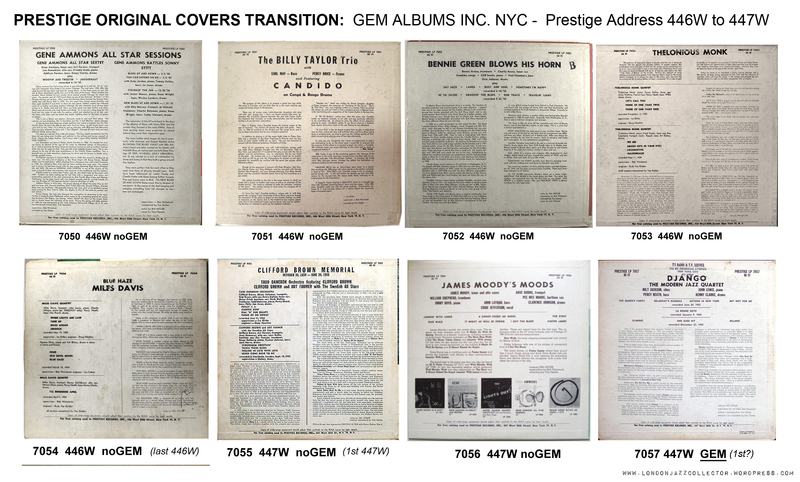 A handful of non-GEM covers carry the new 447 address, which quickly becomes standard on GEM manufactured covers. 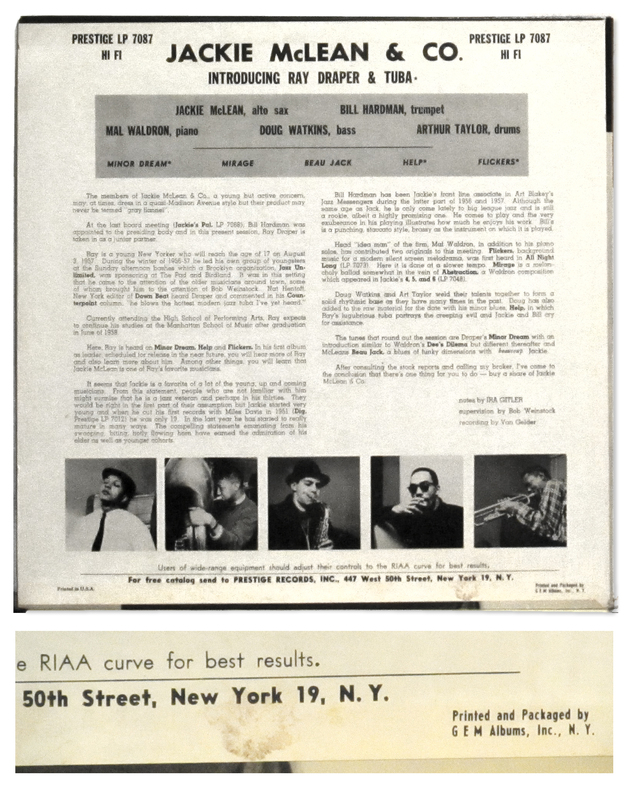 First Pressing Fundamentalists should ensure that their treasured “original” on 446W NYC label is accompanied by the correct early cover, and without GEM imprint. The legend “Printed in U.S.A” appears shortly after, at 7070 and remains a feature of all future covers. 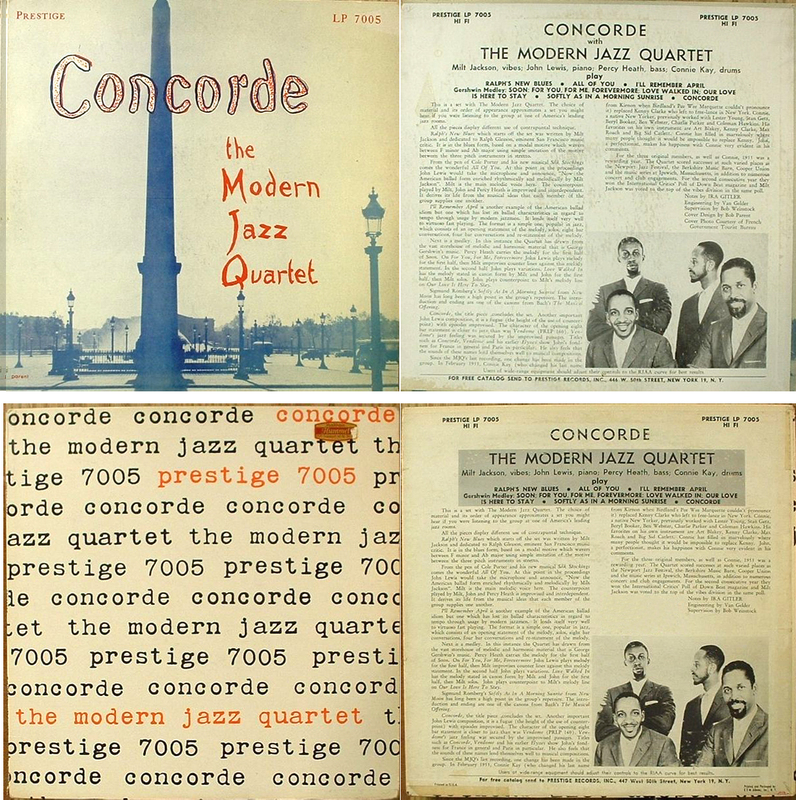 Earlier titles with “Printed in USA” at the bottom of the back cover are later manufactured, indicating later vinyl pressing. 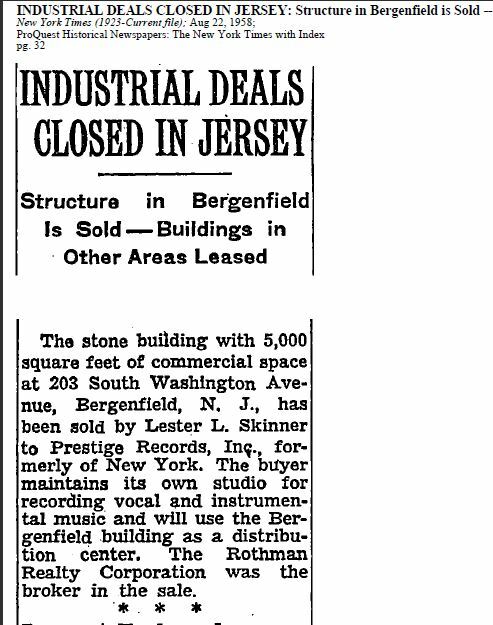 Hereafter follows the 203 South Washington St.,Bergenfield NJ address, remaining until 1971 when Weinstock sold up to Fantasy Records, L.A. and everything moved West. Aside from the tell-tale GEM imprints, one other point to watch with Prestige Records is the presence on earlier releases of reference to or pictures of later titles . 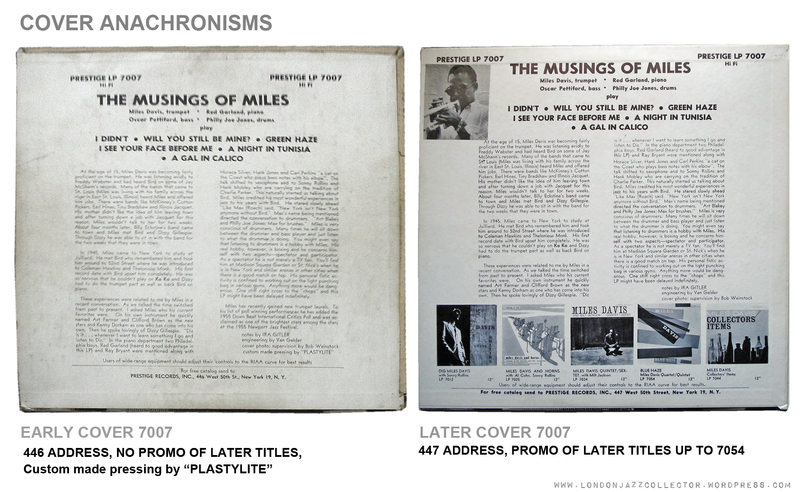 In this example of the reissue of 7007 (right), there are at least three anomalies – the cover addresses is 447 not 446, the reference to Plastylite at the end of the liner notes is found only on the original, and pictures are of five later Miles Davis titles. Hm, I thought you had established that PRLP 7046 was the first album cover with 447 adress, not 7055? You are quite correct, it should have stated 7046 as the first 447 cover address, as per the Reference Table. This is not the first time the fact-checker has let me down, I’m going to have to let them go – again. 7007:” front covers may be exactly the same”, true front has same picture of Miles, without text. However, the Plastylite first pressing/version is non laminated and has kakubuchi (frame) cover, whereas later versions are laminated, non frame. Indebted as always for your acute attention to detail, Rudolf. Last paragraph amended regarding frame construction of original 7007.